Goodwill. Learn about our mission to empower our community. Goodwill was originally named Goodwill of Tucson, founded in 1967 by minister Dale Dunbar. Goodwill gained its non-profit status as well as becoming a corporation on September 19, 1969. The organization officially became Goodwill® Industries of Southern Arizona on September 27th, 1994. Goodwill® moved to its Cherrybell facility in 1975, where it still operates today. In 1969, Goodwill® opened its program doors to provide adults with severe disabilities a place to work. Participants in the Morse Business Center assisted the local business community with helping to create packaging for auto parts, computing equipment, and assembling medical items. As contracts dwindled, Goodwill® transitioned participants over to work within our E-commerce departments. Participants started by processing donated books in preparation for online sales as well as working in our retail stores. In the early 2000s, we opened Job Connection Centers in our retail thrift stores to provide a place where people seeking employment could have access to resources and training. This program is fully funded by Goodwill’s retail sales. As of today there are six Job Connection Center locations spread throughout Southern Arizona. Since the early 2000s, Goodwill® has partnered with the Arizona@Work (Pima County One-Stop) to start providing adult case management and employer outreach services. Once again, this program helps job seekers find employment to support themselves and their families. In 2009, Goodwill® expanded its mission to serve youth with the GoodGuides® Youth Mentoring Program. This program focused on providing youth with one-on-one mentoring. The program has since grown to include in-school mentoring opportunities. In 2011, we became a Pima County partner for Youth Employment to help find Pima County’s youth after-school and summer employment to gain work experience. Goodwill® once again grew its youth services by creating GoodFutures. GoodFutures started as an intensive skills and job training program where at-risk youth would not only learn how to find and keep employment, but also give back to the community through its service learning projects. These projects help them to explore other career opportunities they might not have considered in the past and to possibly find a passion for a certain skill set. 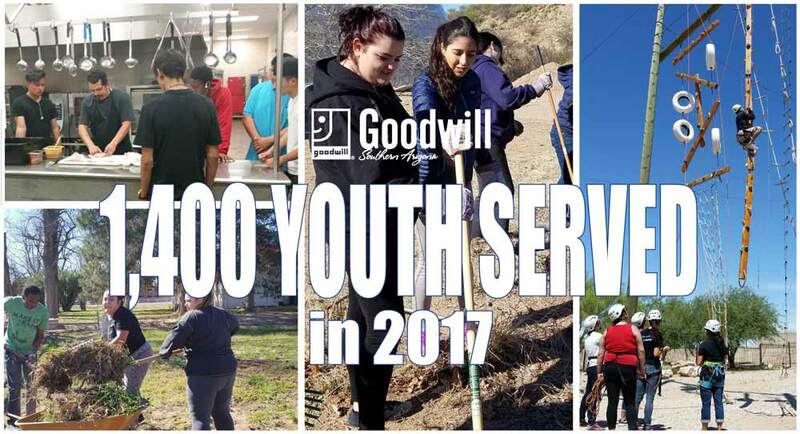 Today, Goodwill® has been extending its reach to the youth population through the creation of the Youth Restoration Project and METRO Youth Program. Goodwill® of Southern Arizona’s first thrift store was a vacant Pep Boys location on 6th Ave/22nd. Due to program needs, Goodwill® has been able to build more stores in the Southern Arizona region. While the economy has seen a downturn over the past decade, our organization has been able to contribute to the local economy by providing more employment opportunities in our retail stores. Each retail thrift store can support 20-25 jobs. Between 2011-2014 alone, we opened eight new thrift stores.